Here are selected some of the most surprising and interesting sinkholes of the the world, arranged by the part of the world and in an alphabetic order. Often it is mentioned that Qattara Depression in Matruh Governorate, Egypt, is the largest sinkhole in the world. This feature is approximately 19,500 km² large, up to 360 m deep. Borders of this structure are not very well defined – in northern part it has precipice, in southern there is gradual rise without cliffs. Mechanism of its formation is not fully clear. As a whole it has little in common with sinkholes. Bushmangat – South Africa. Flooded cave chamber with opening above. Depth 264 m, opening only 30 m long and 12 m across but deeper it becomes larger. Chinhoyi Caves – Mashonaland West, Zimbabwe. Group of legendary, impressive caves with up to 110 metres deep lakes. Extremely high transparency of water where clouds and birds flying over can be seen from 30 metre depth inside the cave lake. Lake Guinas – Namibia. 145 m long, 70 m wide and 132 m deep lake. Endemic fish – Tilapia guinasana Trewavas, 1936. Mangily sinkhole – Diana, Madagascar. The largest sinkhole in Ankarana karst region, up to 700 m across and 140 m deep. Volume – 25 million m³. Baidong tiankeng – Guangxi, China. Very deep sinkhole, up to 312 m deep, opening up to 220 m wide. Adjacent to giant cave room. 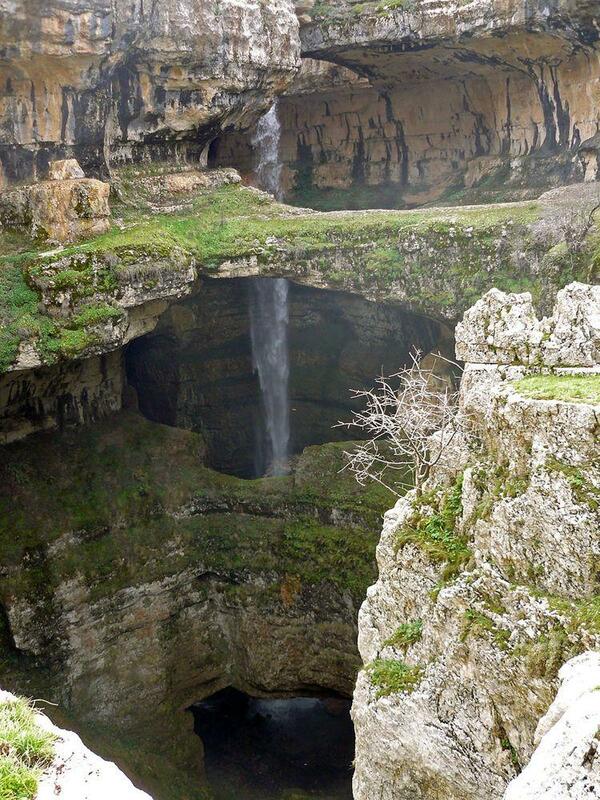 Bala’a sinkhole and waterfall (Baatar) – Lebanon, North. Approximately 255 m deep, nearly vertical cave with waterfall in it. Entrance in the cave is some 70 m deep sinkhole. Here waterfall has percolated one side of sinkhole, creating three natural bridges one above the other. Waterfall disappears underground. Dashiwei tiankeng – Guangxi, China. Enormous tiankeng, up to 613 meters deep, 600×420 metres across. Dragon Hole – South China Sea, Paracel Islands. World’s deepest known undersea sinkhole, 300.89 m deep. Garden of Eden – Sarawak, Malaysia. Possible world’s largest sinkhole which from three sides is surrounded with 150 – 300 m high vertical walls. This is former giant cave chamber with two giant caves (Deer Cave and Green Cave) still continuing in both sides of Garden of Eden. Volume – 150 million m³, size 1,200 x 1,000 m.
Haolong tiankeng – Guangxi, China. One of the largest sinkholes of the world by volume, with degraded walls. Depth up to 509 m, width up to 800 m. Volume 110 million m³. Khammouan dolines – Khammouan, Laos. Limestone mountains contain more than 350 collapse sinkholes, up to 230 million m³ large. Considered to be the largest concentration of large collapse dolines in the world. Many collapse sinkholes contain unknown amount of endemic species, most are not explored. Some dolines are accessible only by air. Layla Lakes – Ar Ryadh, Saudi Arabia. Largest gypsum sinkholes, former lakes which have drained now. In total 23 sinkholes, up to 1,100 m long, up to 50 m deep, with vertical walls. Especially impressive feature is the beautiful, unique gypsum tufa formations covering the walls of sinkholes. Majlis al Jinn – Sharqiah, Oman. Formally this is cave as it still is covered with ceiling – but there have formed three holes in the ceiling, allowing direct, 118 – 158 m tall descent into this enormous void. Ninth largest cave chamber in world in unique setting. People are living on the top of this enormous chamber which has only 40 metres thick ceiling. Qingkou tiankeng – Chongqing Municipality. The most impressive erosion tiankeng, with several waterfalls falling into it, vertical walls. Up to 295 m deep, up to 250 m wide, volume 9.2 million m³. The giant Er Wang Dong cave starts here. Qinlong tiankeng – Chongqing Municipality. One of the most impressive complexes of natural attractions in the world. Very impressive, enormous sinkhole, up to 276 m deep, up to 520 m wide, volume 31.7 million m³. With the giant Qinlong natural arch connected to nearby Shenying tiankeng – up to 285 m deep, 300 m wide. Both tiankengs have two more exits through natural arches – Qinlong tiankeng can be exited through two Tianlong Natural bridges, Shenying tiankeng – through Hailong natural bridge. Sendirian sinkhole (Solo sinkhole) – Sarawak, Malaysia. Visually very impressive sinkhole, up to 240 m deep. At surface level the hole is up to 115 m wide, but the walls are overhanging and below it is larger, with enormous stalactites hanging over the patch of jungle below. Taipingmiao tiankeng – Chongqing Municipality, China. Very impressive sinkhole, up to 420 m deep, with round 180 m wide opening. Tawi Atair – Dhofar Governorate, Oman. Enormous collapse doline, 211 m deep, with vertical walls around. Below, in cave lake lives endemic fish – the only freshwater fish in 600 km radius. Teiq Sinkhole – Dhofar Governorate, Oman. One of the largest sinkholes in the world, up to 250 m deep, 1 km wide, volume 90 million m³. Here enter two perennial streams which disappear underground in the middle of sinkhole. Tongtian tiankeng – Guizhou, China. Very deep and distinct sinkhole. Depth 370 m, opening up to 210 m wide. Volume 7.2 million m³. Getu underground river flows through the tiankeng. Yogoluk sinkhole – Papua, Indonesia. Up to 240 m deep and 180 m wide sinkhole with vertical walls, formed over underground river. Xiaoyanwan tiankeng – Sichuan, China. Giant, partly degraded sinkhole, up to 248 m deep, up to 625 m wide, volume 36 million m³. Xiaozhai tiankeng – Chongqing, China. Largest sinkhole (tiankeng) in the world, up to 662 meters deep, 625×535 meters across. Kavakuna – East New Britain, Papua New Guinea. Enormous tiankeng, located in exotic jungle. Up to 480 meters deep, 380 – 300 meters across, with vertical wall in one side. Kukumbu sinkhole – West New Britain, Papua New Guinea. Partially degraded giant sinkhole, formed above Arrakis cave. Up to 300 meters deep, 1000 meters across, volume 75 million m³. Lusé sinkhole – East New Britain, Papua New Guinea. Giant sinkhole with volume 61 million m³, depth up to 250 m. No vertical cliffs, covered with forest. Sinkholes of Mamo Plateau – Southern Highlands Province, Papua New Guinea. Unique group of more than 100 giant sinkholes located close together. Volume of the largest sinkholes reaches 31 million m³, their walls though are not vertical. Minyé sinkhole and cave – East New Britain Province. One of the largest and most impressive tiankengs (giant sinkholes) in world, located in exotic jungle and crossed by powerful underground river. Up to 510 meters deep, 350 meters across, volume – 26 million m³. It continues as a cave system. Explored length of cave passages is 5,421 m, maximum depth – 468 m. Contains one of the largest cave rooms in the world – Tuké room, 240 m long, 200 m wide and 130 m high. Naré sinkhole – East New Britain Province. One of the most spectacular sinkholes in the world, also located in exotic jungle. Up to 310 meters deep, up to 150 meters across, volume – 4.7 million m³. Walls are overhanging, below flows a powerful river. At the top part of sinkhole, inside it often form clouds. Further cave reaches 415 m depth. Ora sinkhole – East New Britain, Papua New Guinea. Degraded but beautiful sinkhole with volume 26 million m³, depth up to 275 m, width up to 900 m. Double sinkhole with rock bridge in the center. Crveno Jezero (Red Lake) – Split-Dalmatia, Croatia. 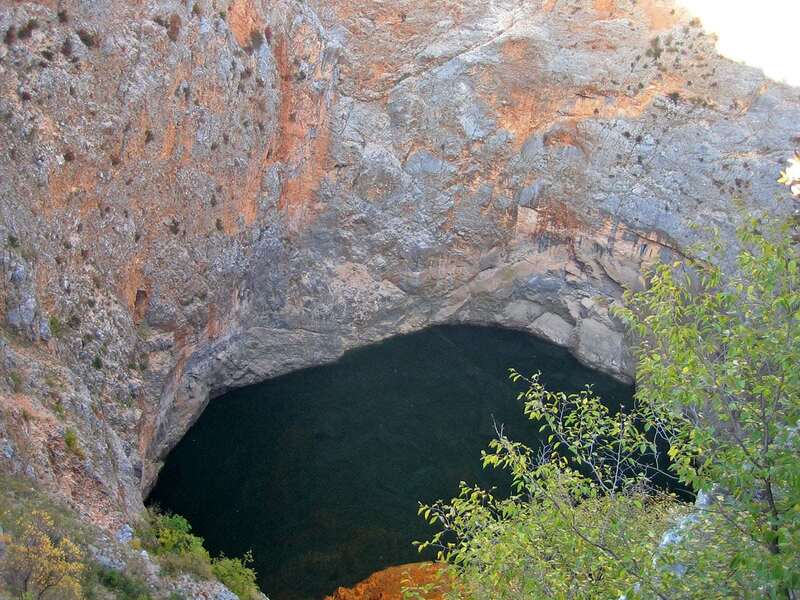 One of the most impressive sinkholes in the world: deep shaft with lake at the bottom. Total depth of sinkhole is roughly 530 m, it contains 280 – 290 m deep lake with endemic fish. Pozzo del Merro – Lazio, Italy. The second deepest known water filled cave in the world with at least 392 m deep waterbody, total measured depth – 472 m, formed in Triassic limestone. This is nearly vertical cave – the upper part of it is a sinkhole. Velika Dolina and Mala Dolina – Slovenian Littoral, Slovenia. Two closely located enormous sinkholes. Velika Dolina is up to 165 m deep, 300 by 177 m wide. Mala Dolina is up to 130 m deep, 170 by 120 m large. Black Hole of Andros – South Andros, Bahamas. Flooded sinkhole with a layer of violet jelly layer of bacteria at 18 meters depth. Microorganisms have heated the water up to 40 degrees C°. Dean’s Blue Hole – Long Island, Bahamas. 202 meters deep sinkhole in the sea, the entrance is only 25 – 35 meters across. El Zacatón sinkhole – Tamaulipas, Mexico. World’s deepest water-filled vertical shaft, 339 meters deep sinkhole with 319 meters deep lake. Floating islands in the lake. Great Blue Hole – Belize District, Belize. Perfectly round undersea sinkhole, 318 meters across and 124 meters deep. Hoya de las Guaguas – San Luis Potosi, Mexico. Sinkhole – cave of giant size. Entrance shaft is 202 m deep, total depth 478 m, cave chamber up to 290 m tall. Thousands of swifts and parrots live in the sinkhole. Neversink Pit – Alabama, United States. Visually very impressive 50 m deep sinkhole, 12 m wide at surface and 30 m wide at the bottom. Night time visit is very impressive as there are numerous glowworms on the walls of pit. Waterfalls. Poza Seca – Tamaulipas, Mexico. One of the unique travertine capped sinkholes in Sistema Zacatón: formerly open sinkhole has sealed itself with a limestone lid. Most likely it hides unknown life forms, not investigated. Sacred Cenote – Quintana Roo, Mexico. Human sacrifice site of the ancient Mayan Chichen Itza city. In deposits discovered huge amounts of gold and jade artefacts as well as human remains. Vermilion Creek sinkhole – Northwestern Territories, Canada. Impressive sinkhole in gypsum layers. Walls are vertical, at 40 metre depth is located lake of unknown depth. Sótano del Barro – Querétaro, Mexico. One of the largest sinkholes of the world, 455 m deep, with 410 m direct fall. Width – 420 m, formed in Lower Cretaceous limestone. Sótano de la Culebra – Querétaro, Mexico. Narrow sinkhole with total depth of 360 m, free fall – 336 m.
Sótano de las Golondrinas (Cave of Swallows) – San Luis Potosí, Mexico. The largest cave shaft in the world – enormous 49 x 62 metres wide hole, 372 metres deep. Famous due to a group of green parrots who have to fly ascending in circles around the cave until they get out of it. Tres Pueblos Sinkhole – Puerto Rico. Nearly circular sinkhole, 180 m wide, 120 m deep, with vertical walls. Unedrground river flows through the sinkhole. X’kekén Cenote (Dzitnup Cenote) – Yucatán, Mexico. One of the most photographed cenotes, with beautiful deep blue lake and sun beam lighting it through the ceiling, numerous stalactites. At least 35 m across, distance between the ceiling and water is some 20 m.
Lago Azul – Goiás, Brazil. Water-filed sinkhole, dived up to 274 m depth. Peruaçu North and Peruaçu South – Minas Gerais, Brazil. Two giant sinkholes above the underground part of Peruaçu River – Janelão river cave. Sinkholes are up to 170 m deep, up to 450 m long. Volume of Peruaçu North is 10 million m³. Sima Aonda – Bolivar, Venezuela. 383 meters deep, ancient quartzite sinkhole, with waterfall and stream flowing through it. Sima Humboldt and Sima Martel – Bolivar, Venezuela. 314 and 248 metres deep, ancient quartzite sinkholes located on the top of forested table-top mountains and containing patches of isolated, primeval rainforest on their bottoms. This category includes outstanding sinkholes – large natural depressions or holes, which for most part represent collapsed caves. Often there is used equivalent term – doline – what in Southern Slavic languages means "depression". Some consider that "sinkhole" is more used in American literature and "doline" – in European, but there is not very distinct trend. Many sinkholes, which have vertical walls, to some extent can be considered to be caves as well – although, strictly speaking, cave is underground void where can enter people: e.g. there is needed a layer of rock above these people. The opening of sinkholes is above the visitors. Most sinkholes are formed by karst processes – by natural solution of carbonate (f.e. limestone, dolomite), sulphide (f.e. gypsum) and salt rocks. Solution process is initiated by water. Especially efficient is rainwater (because it is slightly acidic from atmospheric carbon dioxide) and even more – hot water (because it speeds up the solution and bears more dissolved material) and acidic water. Unique example of sinkholes created by heated, acidic water, is Sistema Zacatón in Mexico, Tamaulipas. Here have formed more than 20 karst features including more than 300 m deep sinkholes filled with warm water and some even sealed with travertine lids! Few large sinkholes have formed also in sandstone rock. Here takes place another geological process – suffosion. In many respects it is similar to karst processes. Sand particles in sandstone are cemented – often with carbonates, clay, sometimes also with silica. Water dissolves this cement (of course, dissolving silica is very very slow process) and then carries away the unfettered sand particles. 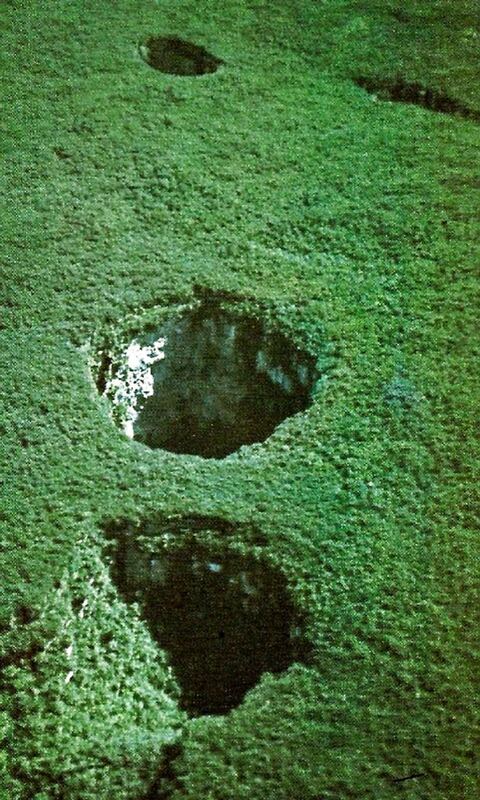 The largest sinkholes in sandstone are Sima Humboldt and Sima Martel in Venezuela. These are unique, up to 314 m deep holes with vertical walls and their formation has required many millions of years. Most sinkholes are collapsed cave rooms (collapse sinkholes). Streams flowing through cave passages gradually increase the size of cave rooms until the roof becomes thin and collapses. If whole layer of rock is soluble, water dissolves and brings away even the collapsed roof and there forms fine hole in the ground – often with the stream still flowing through it. in the ground (erosion sinkhole, might be called also vadose sinkhole). Sometimes these sinkholes still have beautiful waterfalls falling into them. Extreme example of such sinkholes is Qingkou Tiankeng in China, Chongqing Municipality – it is 295 m deep, up to 250 m wide. To some extent the process of the formation of volcanic calderas is similar to the formation of traditional sinkholes. Also in volcanoes there form large underground voids which collapse, leaving enormous holes in the surface of the Earth. The size of some volcanic calderas exceeds the size of any sinkhole. La Garita Caldera (Colorado, United States) is 35 by 75 kilometers large. Nonetheless the mechanism of formation of volcanic calderas is driven by completely different geological processes and Wondermondo reviews them as landmarks related to volcanoes. Karst processes mostly are on-going above sea level – if there is layer of carbonate rock and enough rain, caves and sinkholes and sinkholes are formed by underground streams. In the past major areas of Earth were taken by glaciers and sea level was lower than now. Some 20 thousand years ago the sea was even more than 100 metres below the current level. Numerous areas around the world were dry where today is sea. In some of these areas took place intense karst processes forming also deep and impressive sinkholes. Now such sinkholes are covered with sea water, forming exciting natural attractions – blue holes. Some of the most impressive are Great Blue Hole (Belize, Belize District), Dragon Hole (South China Sea, Paracel Islands) and Dean’s Blue Hole (Bahamas, Long Island). Below are listed some popular kinds of sinkholes – black holes, blue holes, cenotes, sótanos and tiankengs. Black holes are unique geological and biological monuments found only in Andros and Grand Bahama islands (Bahamas) – in total some 30. The best known is Black Hole of Andros (Bahamas, South Andros). Black holes are formed in carbonate mud flats (not a common phenomenon either) – sea water slowly dissolves this clayey substance, creating amazing, round structures filled with weird, black water. These sinkholes are not too deep – up to 47 m.
The menacing black color is caused by the most amazing feature of black holes – layer of phototrophic sulphur bacteria. This layer "swallows" the light and causes the black color of water. Bacteria have heated up this layer up to 40°C – possibly the only case in world where bacteria manage to heat up the water. Blue hole is a term applied to some of those sinkholes which are filled with water – irrespective of their mechanism of formation. It seems that the decisive factor in the use of this term is the beautiful deep blue color of water in these formations. This color is created by high transparency of water and bright white carbonate sand. Blue light is the most enduring part of spectrum: where other parts of spectrum – red, yellow and finally the green – are absorbed during their path through the water, blue light manages to reach the white sand and return back after the refraction. 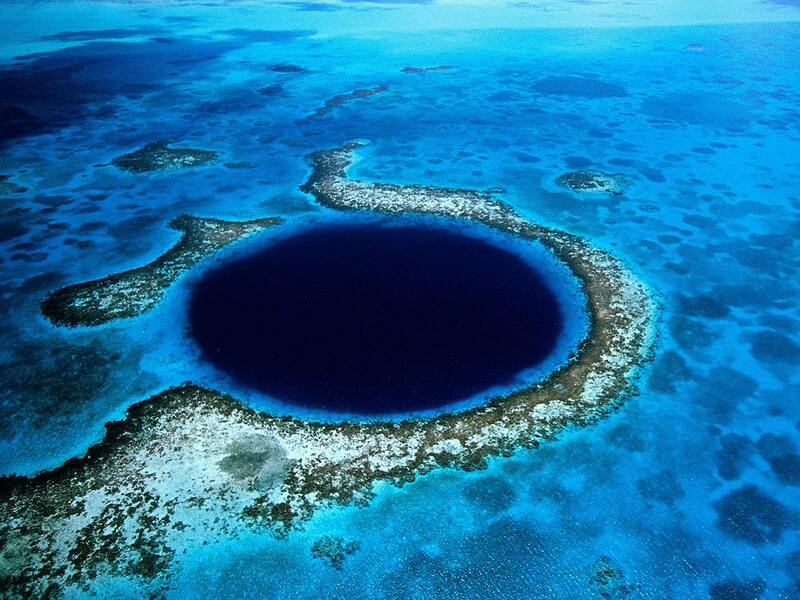 The term has been first used in Bahamas, where are numerous blue holes. Specific monuments of nature and often – culture are many cenotes – large sinkholes found mainly in Yucatán Peninsula, Mexico. These round, water filled sinkholes often had huge importance for nearby Mayan cities as a source of potable water and sometimes as sacrifice and ritual sites (Sacred Cenote in Quintana Roo, Mexico). Formation of cenotes is linked to another unusual monument of natural history – fall of the Chicxulub meteorite some 65 million years ago. After the fall of meteorite formed large basin where thick layer of carbonate rocks was deposited. Present-day cenotes have formed along the rims of this ancient basin. Some giant, deep sinkholes with nearly vertical walls in Mexico are called sótanos – the best known is the 372 m deep Sótano de las Golondrinas – Cave of the Swallows (Mexico, San Luis Potosi). several of these sinkholes correspond well to criteria of tiankengs. Extremely large and visually impressive natural sinkhole is called tiankeng – this term is introduced by Chinese geologists. To earn this name the hole must be at least 100 meters deep and wide, with vertical walls and with a cave river below. There are some 75 tiankengs in the world, most of them in China. The largest one is Xiaozhai tiankeng (Chongqing, China): incredible 662 meters deep and up to 537 meters wide hole with vertical walls. Another region with tiankengs is Papua New Guinea, especially New Britain island, where these sinkholes are located in the middle of lush jungle and have jungle also on their bottoms. Some more tiankengs are in Mexico, Croatia, Venezuela and other countries. List of the largest sinkholes of the world – Unique review of the largest sinkholes of the world – deepest, most capacious and most unusual ones. Includes table of world’s largest naturally formed sinkholes which are well pronounced (f.e. NOT included gently sloping valleys e.g. mega-dolines) and at least 150 m deep. “Sinkholes and Subsidence” provides a twenty-first century account of how the various subsidence features in carbonate and evaporite rocks cause problems in development and construction in our living environment. The authors explain the processes by which different types of sinkholes develop and mature in karst terrains. Originally published in 1989, Karst Geomorphology and Hydrology became the leading textbook on karst studies. This new textbook has been substantially revised and updated.